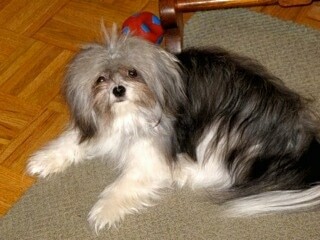 A smooth and a long-coat Mi-Ki, photo courtesy of Paddington's of Mi-Ki Breeders USA, Inc. The Mi-Ki has a small "apple domed" head (the International Mi-Ki Registry's Mi-Ki heads are rounded, but not domed.) It has a short, wide muzzle with a well-defined stop (the region where the muzzle joins the skull); a muzzle that is pushed in or long and narrow are considered major faults. The muzzle length varies from 1/2 inch in length to 1 1/2 inches. The teeth are level to slightly under-shot. The eyes are large, round and set well apart; dark is most desirable, but blue with a blue-colored coat and brown or ruby with a brown-colored coat are acceptable. The nose is medium in size and flat on top with wide nostrils, never pinched. 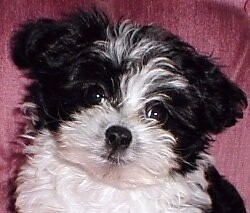 Generally, the nose is black but can be self-colored on brown or lighter coated dogs. The ears are very mobile! The Mi-Ki ears can be carried erect or dropped. Both ear types are capable of "winging" their ears when extremely excited. Ears must be feathered. The neck is of medium length, and should never appear short or thick. Although the Mi-Ki appears cobby, the body is slightly longer than the height, measured at the shoulders. The back line is straight and level. The chest is of medium depth. The ribs are well sprung. The forequarters have a well-developed shoulder that is laid back to allow freedom of movement. The forelegs are always straight and never bowed. Feathering must be present. The hind legs are parallel when viewed from behind. Dewclaws are usually removed, however some clubs state leaving the front dewclaws is optional. The feet are hare-like in shape, thin and elongated. All four feet must be shaved. When relaxed, the front feet may turn slightly outwards. The feet are dainty and slightly webbed. The tail is set high, carried gaily and well arched over the body with fringing. There are two coat types, smooth and long. The smooth coat lies close to the body and skull with no presence of a beard or mustache on the face, and has short fringing on the ears and on the front and rear legs and the tail. The long coat is fine, silky and straight, with long feathering on the ears and on the front and rear legs, and on the tail. 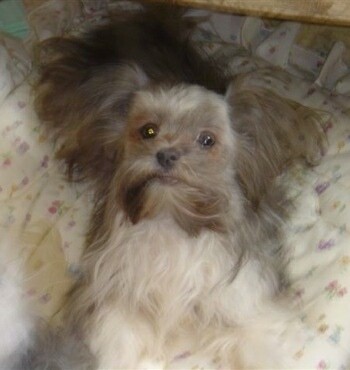 The long-coated Mi-Ki may have a beard and mustache and must have a neatly shaved head. All colors are acceptable, including dilute colors. Solid colors are rare and highly prized. The gait should be light and smooth with a free-flowing action and when viewed from the front or rear should be straight and true. The general appearance should be one of elegance and grace, with long, silky non-shedding hair. The Mi-Ki is intelligent, calm, sweet natured, affectionate and its activity level is low to moderate. Friendly and alert, making an excellent companion to the handicapped, it is laid back and seldom barks. Some also make a sound much like a yodel or a type of joyful twittering. This breed possesses a high degree of intelligence, making it a top candidate for the obedience ring. They love to be around people, and readily accept strangers. The Mi-Ki has a very even temperament, which makes it an ideal therapy dog. The Mi-Ki loves kids. The Mi-Ki enjoys sunning on a window sill and washing itself like a cat. In fact, one Mi-Ki raised an entire litter of abandoned kittens. The Mi-Ki is not aggressive, nor is it intimidated by dogs. This same female who raised the litter of kittens also raised a litter of five Lamalese puppies. By the time these pups were four weeks old they were almost as big as the Mi-Ki. The Mi-Ki is extremely social and catlike in its mannerisms. It is such an adaptable little dog that many people who otherwise wouldn’t be able to have a pet find they can indeed have a Mi-Ki. 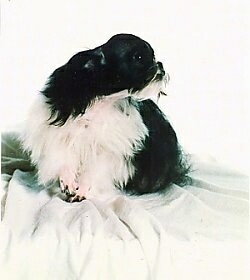 The Mi-Ki can climb much like one of its ancestors, the Japanese Chin, and act catlike as it pounces on, chases and swats at its toys or playmates. They are easy to train and seem eager to adapt to your lifestyle. Make sure you are this dog's firm, confident, consistent pack leader to avoid Small Dog Syndrome, human induced behavior problems. When dogs are allowed to be pack leader to humans they can develop many types of behavior issues, including, but not limited to, being suspicious of and barking at strangers, guarding, separation anxiety, destructiveness, snapping, and even biting. These are NOT Mi-Ki traits, but rather behaviors resulting from a lack of leadership on the humans’ part. Always remember, dogs are canines, not humans. Be sure to meet their natural instincts as animals. They need rules to follow, limits as to what they are and are not allowed to do and a firm, consistent, confident pack leader, along with daily mental and physical exercise. Mi-Kis with shorter muzzles, particularly older dogs, are in definite risk of respiratory problems. Mi-Ki teeth need frequent cleaning, particularly the short-muzzled type. Mi-Kis are also inclined to have excessive hair between their toes which traps dirt. Having the face and feet shaven allows for easier care in keeping them clean and healthy. The Mi-Ki is an excellent apartment or condo dog. It can easily be trained to use a litter box. It can adapt to most climates, but loves to get outdoors for a walk. It can be happy and healthy with a small yard. The Mi-Ki need a daily walk. While out on the walk the dog must be made to heel beside or behind the person holding the lead, as in a dog's mind the leader leads the way, and that leader needs to be the human. Play will take care of a lot of its exercise needs, however, as with all breeds, play will not fulfill its primal instinct to walk. Dogs that do not get to go on daily walks are more likely to display behavior problems. They will also enjoy a good romp in a safe, open area off lead, such as a large, fenced-in yard. Teach them to enter and exit door and gateways after the humans. For pets, use a wire comb once a week to remove dead hair. Bathe only when necessary. The show cut for a Mi-Ki is very distinct. The head, neck and ears are all shaven. The head shaving extends from the base of the skull to the base of the throat. The feet and legs are also shaven to the pastern. The shaving of the legs includes the dewclaws. It is also necessary to remove the hair from between the toes and around the pads. The reason for this cut is to reduce the risk of health problems. The Mi-Ki sheds little to no hair. The Mi-Ki, as a breed, has been split between a few different clubs. These clubs are setting their own standards and the dog is quickly becoming very different from club to club, but all still have the same name, Mi-Ki. There are different theories to the origin of the Mi-Ki. According to the Mi-Ki™ Club of America, Inc., the Mi-Ki is thought to be Asian. The timeframe of when this tiny toy dog is said to have appeared in the U.S. is approximately during the 1980s. 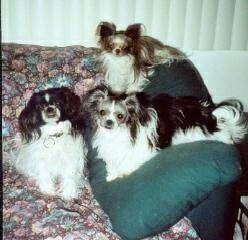 It shares common ancestors with the Papillon, the Maltese, and the Japanese Chin. Unfortunately the cloudy history of the Mi-Ki makes it impossible to tell the percentage of each breed in its makeup. The Mi-Ki was recognized by the States Kennel Club in 1995. According to the IMR, the Mi-Ki is a new breed started in the late 1980s by a woman who went by the name of Micki Mackin, among others. She resided in Milwaukee, Wisconsin, and its suburbs. 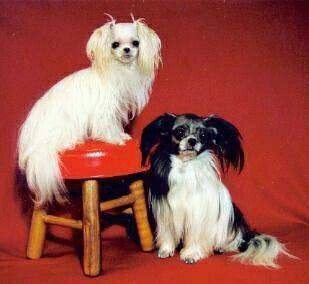 She started developing a strain of small dogs from the Papillon, Japanese Chin, Maltese and the small Shih Tzu and in 1993 there was a Papillon / Yorkshire Terrier mix stud that she introduced to some of the females. Unfortunately, she did not keep accurate records, so the degree of mixture or combination of the breeds used is not known. 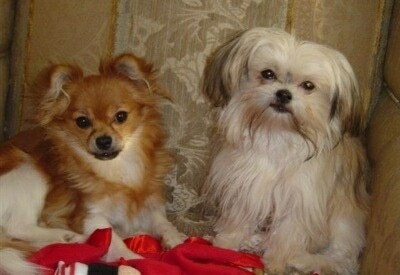 Some credit Micki Mackin with the use of her name when she called the little dogs Mi-Kis (pronounced Mee-Kee). The International Mi-Ki Registry proclaims to be the Developing Founder. The IMR has taken that strain and through a strict breeding program, including DNA profiling through the United Kennel Club, Inc., is developing and refining the Mi-Ki into a new "made in USA" pure breed. MCOA = Mi-Ki™ Club of America, Inc.
States Kennel Club was the first registry to recognize the Mi-Ki, thru the Mi-Ki™ Club of America, Inc. Another registry is the International Mi-Ki Registry. The Mi-Ki Breeders USA is both a club and registry. They can also be shown with IABCA and the National Canine Association. At this time the IMR Mi-Ki is club-registered and its DNA is recorded with the United Kennel Club, Inc. The IMR is seeking breed recognition through the UKC. In 2002 the Mi-Ki™ Club of America, Inc. received full recognition of the dogs in its stud books through the RVD/UCI, which is based in Germany. The RVD/UCI recognition also makes these Mi-Ki eligible to be shown in 16 other countries throughout the world and only applies to the dogs in the Mi-Ki™ Club of America's stud books, which were established in 1992. No other stud books are known to exist. The MCOA was founded in 1992, the IMR in 1999, the Continental Mi-Ki Association in 2002 and the Mi-Ki Breeders USA in 2003 as a recognized club and registry for the purebred Mi-Ki. "Mi-Kis wing their ears when excited. This is my sweet little Jenny, who has down ears when not excited. 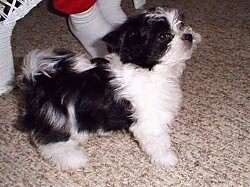 Jenny also had beautiful colors in her last litter: a blue, a chocolate and a red. It is always a surprise and such a delight the colors you may get, you just never know." 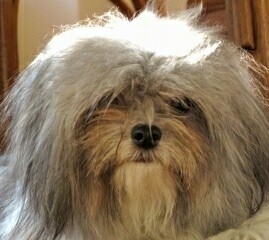 Photo courtesy of Paddington's of Mi-Ki Breeders USA, Inc.
"This is Willie at eleven months. He is a tad bit friendlier with people and still loves non-aggressive dogs. He is sweet with all dogs, never barks or growls at them. He loves to play catch and fetch and could learn a trick every day. We live in a building with many dogs, including two other Mi-Kis, but his favorite is another Mi-Ki named Chai. He loves to hide in closets and suitcases. He is a big boy at 7 pounds. He is a keeper." "Willie, a Mi-Ki reached his first birthday. His favorite activity is to chase his miniature tennis ball, but any ball will do. He is so smart and loyal. I am so happy I discovered this breed. Still a keeper." 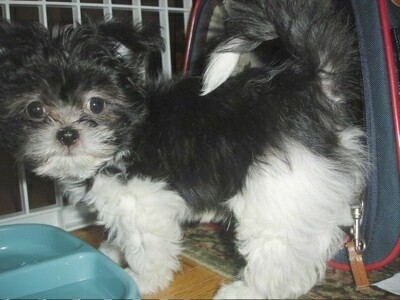 "Willie is a three-month-old Mi-Ki puppy in this picture. He is smart and lovable. Is paper trained and already understands the sit command. He loves to play ball and to cuddle. We hope to have him certified as a therapy dog." 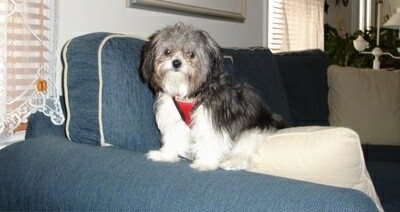 "This is Willie the Mi-ki at 7 months old, weighing just under 6 pounds. He doesn't walk, he prances and his feet barely touch the ground. People always stop to look and laugh. He is so smart, sweet and a tad bit shy with people, but loves other dogs especially Golden Retrievers. He is a real keeper." 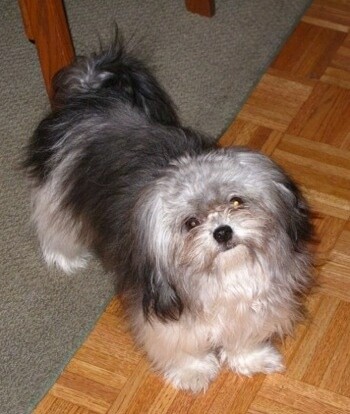 Mi-Ki named Kelee who belongs to one of the members of the Mi-Ki™ Club of America, Inc. Kelee is living in Canada.